2004: Given a two year contract extension through on September 3. Pitching coach of Roy Halladay, the 2003 CY Young award winner. 2002: Began the season as the Bullpen Coach. Named Blue Jays Pitching Coach on June 5. 2001: Named as the Bullpen Coach of the Toronto Blue Jays on November 27, 2000. 1997-2000: Spent four seasons with the Arizona Diamondbacks as their minor league pitching coordinator. 1996: Roving minor league pitching instructor for the A's organization. 1995: Coach for the Scottsdale A's of the rookie League. 1994: Coached in the Midwest League (A) with the West Michigan Whitecaps. 1992-1993: Coach for the Madison Muskies of the Midwest League (A). 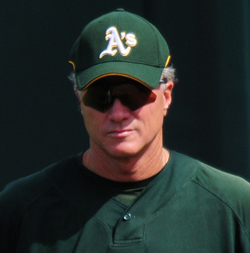 1991: Joined the Oakland A's organization and coached in the Arizona Rookie League in Scottsdale. 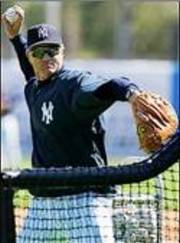 1984: Began his coaching career with the New York Yankees Organization. Worked with Mark Conner in Columbus (AAA) for one half of the season and then moved to Oneonta of the New York-Penn League (A). 1983: Attending spring training with manager Joe Torre and the Atlanta Braves. Had Tommy John surgery following spring training. 1982: Joins the San Francisco Giants organization and made four starts with Fresno (A). Was 1-1 with a complete game and a 1.33 ERA. 1981: Made just seven appearances with the Yankees Class A affiliate in Fort Lauderdale, Florida. Was 1-4 with a 3.20 ERA. 1980: Pitched in the Yankees organization for Bradenton where her was 5-2 with 1.58 ERA in eight starts with two complete games. 1979: Unable to pitch after surgery in 1978. Experimented pitching with his left hand during spring training. 1978: Spent the season on the disabled list after surgery to repair a torn rotator cuff. 1977: Opened the year in Syracuse (AAA) before joining the Yankees at age 21. Appeared in ten games, six starts, with the eventual World Series Championship and was 1-2 with a 5.45 ERA. Earned his first major league win over the Texas Rangers on May 25. Following a May 31 start against Boston, Carl Yastrzemski said he was the best young pitcher he's seen in the AL in some time. On disabled list from June 15 to July 14. Did not pitch in the post-season. 1976: Split the season between West haven (AA) and Syracuse (AAA) and combined to post a 16-4 record in 23 games, 19 starts with eight complete games. Pitched a 1-0 no-hit victory against Williamsport on June 28. Was 2-0 in the Governor's Cup Playoffs. 1975: Made his pro debut with the Oneonta where he was 8-4 with a 1.95 ERA and six complete games in his 14 appearances, 13 starts. Led the New York-Penn League (A) in strikeouts with 97 in his 106 innings of work. Graduated from Miami Dade South Junior College where he pitched and DH’ed was selected as the team MVP. Drafted four times prior to signing with the Yankees. 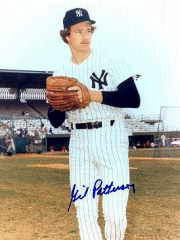 Yankees #1 selection in the secondary phase of the June 1975 draft by Pat Gillick. In total, Patterson had eight operations during his career. "Gil Patterson's throwing mechanics, drills, arm maintenance program and mental approach has helped me pitch in the major leagues for 15 years." I recommend his program for pitchers of all ages. "Gil Patterson's encouragement, knowledge, teaching, drills and mental approach have helped make me successful in my major league career."